While I haven't had the chance to see this film yet, I've heard great things and seen lots of great reviews since it premiered at the Sundance Film Festival earlier this year. Focus Features, who acquired the film for US distribution, has announced that Dee Rees' indie drama Pariah will be opening in limited theaters (in New York, Los Angeles, San Fran only) starting Sunday, December 25th, Christmas Day later this year. In addition to that announcement, they've unveiled the official poster for Pariah, which was chosen by fans online on the official Facebook. You can see the poster in full below, along with the trailer, and more details. A rousing success at its Sundance world premiere, this deeply felt human drama is the feature debut for young female writer/director Dee Rees. In Pariah, Adepero Oduye portrays Alike (pronounced "ah-lee-kay"), a 17-year-old African-American woman who lives with her parents (Kim Wayans and Charles Parnell) and younger sister (Sahra Mellesse) in Brooklyn's Fort Greene neighborhood. A gifted student, Alike is quietly but firmly embracing her identity as a lesbian. With the support of her best friend Laura (Pernell Walker), she is especially eager to find a girlfriend. Wondering how much she can confide in her family, Alike strives to get through adolescence with grace, humor, and tenacity. Pariah is playing at the Toronto Film Fest this month, and has been receiving some incredibly positive praise all year long (see criticWire). 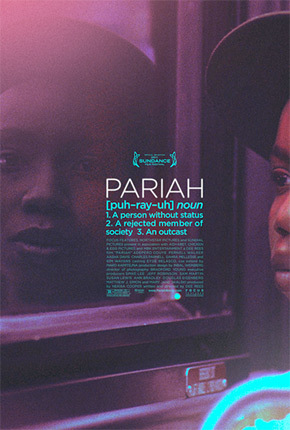 A world premiere at the 2011 Sundance Film Festival, the contemporary drama Pariah is the feature-length expansion of writer/director Dee Rees' award-winning 2007 short film Pariah. Filmmaker Spike Lee is among the feature's executive producers. At Sundance, cinematographer Bradford Young was honored with the Excellence in Cinematography Award for his work on the film. With the public having now selected the Pariah one-sheet poster (seen to the right), Focus is also announcing the movie's theatrical release. After opening in NY, LA and SF only on December 25th, it will continue to expand to additional cities throughout the winter. A.O. Scott of the NY Times wrote in his review of Pariah: "To watch Adepero Oduye… is to experience the thrill of discovery." Quite the praise. In addition to the poster featured here, I've added the official trailer for the film below as well. I haven't seen Pariah myself yet so I can't speak for the film, but the praise its getting and all the buzz I've heard makes it worthy of being featured anyway. Like with all indies, I expect this to connect with a few people in particular, but I'm more than happy to introduce this film to as many people as I can. If you're already curious, then watch the official trailer below from Focus Features, or visit their Facebook page or official website at those links. Focus is giving this a very strong awards season push, so we expect to see/hear about it quite a bit these next few months. Has anyone seen it already? wow, this movie actually looks pretty damn good. is being a lesbian still that much of a big deal? Obviously it is for some folk. Looks good. I really like to poster too. I cant wait for it to come to Austin Texas! I'm super excited!